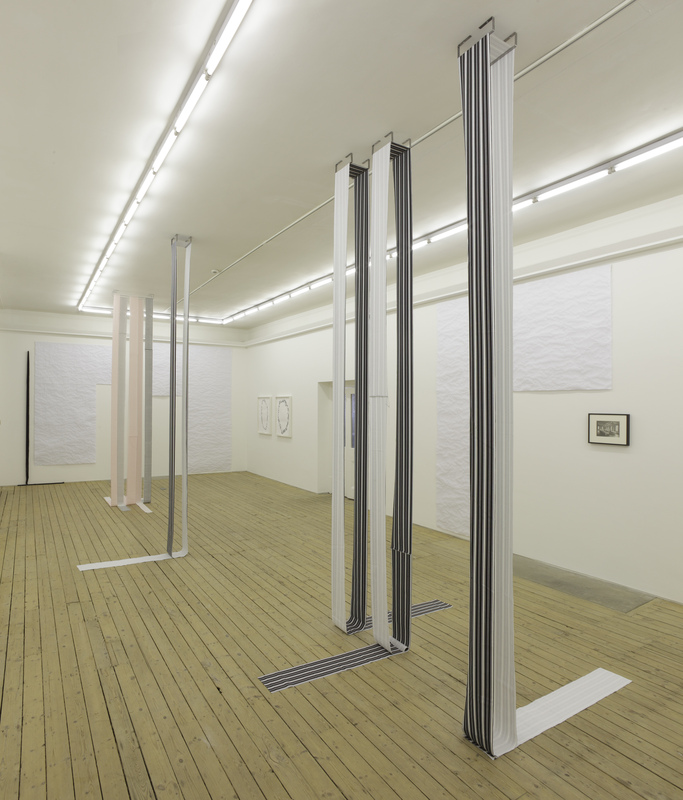 In Worn-work Alice Channer explores the potential for her works to inhabit a physical space and to have the feeling of being inhabited, paralleling the way clothes are worn on the body. 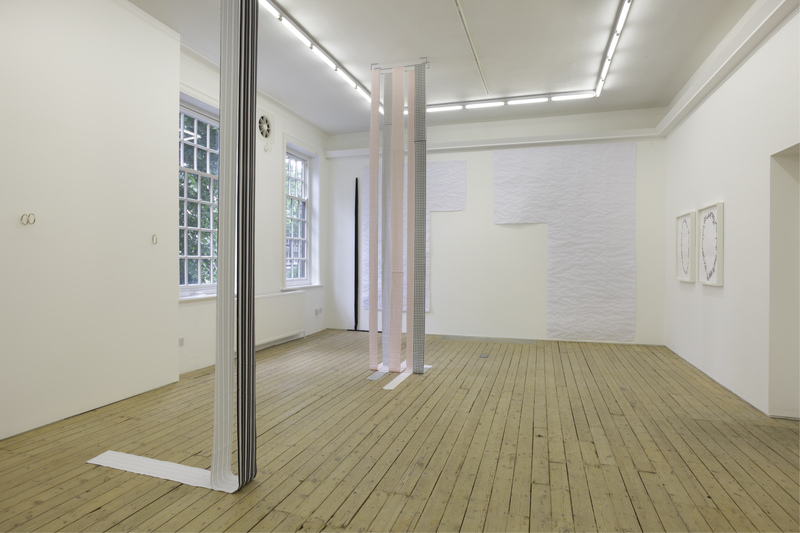 Whilst making this show Channer’s whole practice has been conceived as a fabric that she can cut, fold (repeat) parts of into different forms to make new works. 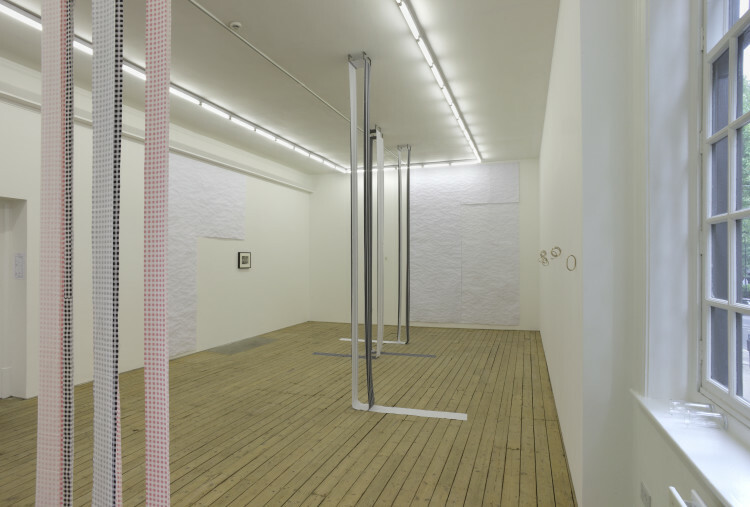 Channer’s work frequently uses imbalance or locates details on the edges rather than in the centre of the work, giving the impression of parts left to signify a whole, with anthropomorphic touches that suggest an awkward intimacy with the space in which they are housed. The works themselves, like fabric, are largely very flat, but these flat surfaces are places that she weaves into and across. In this respect the surfaces of the works themselves and the spaces they are shown in are no different – everything becomes the ‘material’. Flatness becomes a form of compression, a means of concentrating potential into a surface. Past works have done this using pleating folding and scrunching and for Worn-work, many of the works involve stretching. The water in the surface of the seersucker paper that Channer has created literally stretches their surface so that it can bounce light in many different directions. 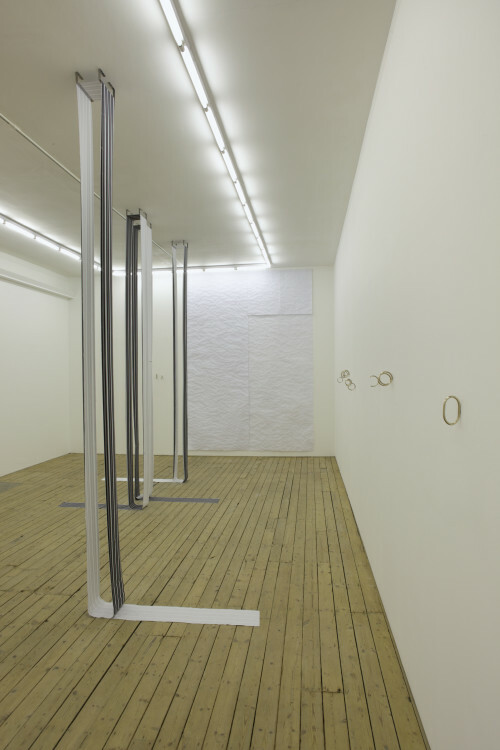 The fabric hanging works use very narrow strips of fabric to stretch the space from ceiling to floor and some of the cast bangles have been pushed and stretched to make ellipses, as have the dots in the pattern of the scarf drawings. Stretching is also used in relation to scale, as several of the works begin with a detail that is then magnified across the length, width or height of the gallery. Worn-work describes the closeness and extreme proximity that the works assume – to the artist, the viewer, to each other and to the space they are shown in. Channer creates an ambiguity about who is the wearer with titles such as A Body, Yours or Mine. Many of these works can be looked through, creating the sensation of looking with the work, not at it. The hanging fabric work I Cannot Tell The Difference Between One Thing And Another describes an attempt to collapse the difference between front and back, inside and outside, one thing and another, whilst describing the extreme awkwardness and perhaps the impossibility of this kind of acrobatics. This logic begins in the scarf drawings and seersucker works that position water and cigarette ash in their surfaces, and gouache and pencil on the surface, expanding the surface of a sheet of paper both inwards and outwards beyond its apparent limit. The printed fabric of the hanging works take over both the front and back of what was previously a one- sided cloth, and encompasses the space in-between. 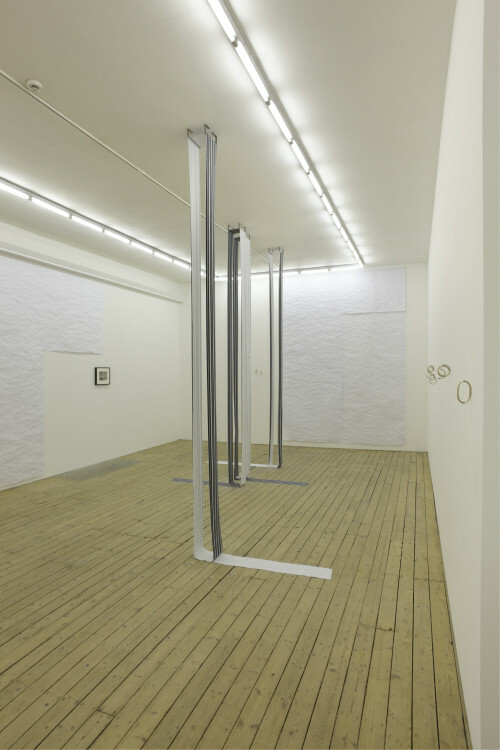 These works also claim the ceiling as a part of the show by attaching their metal brackets to it, which become like plinths, in effect inverting the ceiling into the floor and the floor into the ceiling.